Some people fear preparing fish at home, thinking it's more complicated than it really is. These recipes will prove otherwise, making it surprisingly simple to whip up a beautiful salmon meal for your family or friends. Scandinavian cured salmon, or homemade gravlax, tastes great on toast, bagels, or crackers—and it's actually easy to make at home. If you can't find Aquavit, a Scandinavian spirit, vodka will also work. Pacific salmon can sometimes carry a parasite, so freeze it for 30 minutes before using to kill any potential pests. These simple succulent salmon cakes are a great way to use up leftover fish, but you can cook up some fillets just for this purpose or even use canned. Add a little cayenne pepper for extra kick or enjoy these flavorful patties without if cooking for picky eaters. Serve them with a light salad or on a bun like a burger. 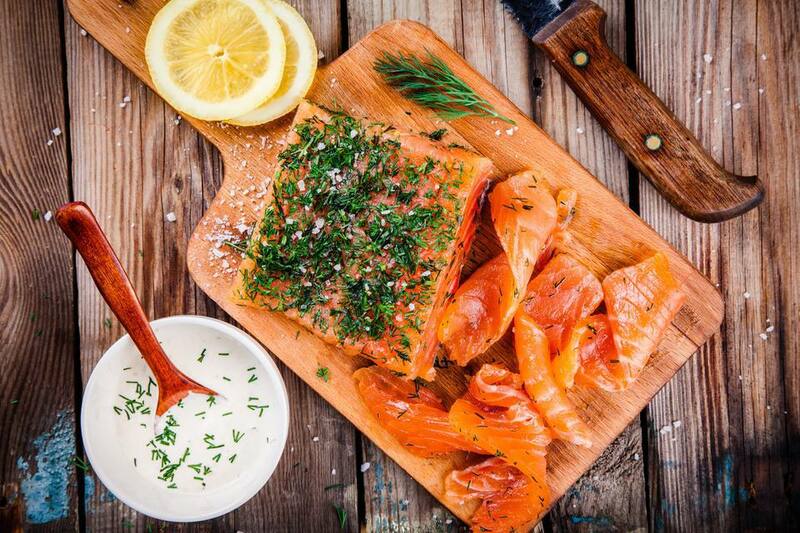 You can create slightly sweet smoked salmon on the grill or even your stovetop. Use cedar wood chips for a nice, light flavor or hickory if you can't find cedar. Note that this recipe calls for letting the salmon sit with the rub on top for about four hours prior, which creates a nice firm texture. Using leftover rice pilaf or cold white rice makes this one-dish one-dish leftover salmon fried rice recipe a snap to pull together on a busy work night. While it calls for canned salmon, you can also use leftover salmon fillets. Add frozen peas and any other vegetables you prefer to round it all out. A wok works best, but you can make it in a skillet, too. Using the method featured in this simple grilled salmon recipe, you can make delicious grilled salmon fillets, no turning required. Any type of salmon you can find works well and plan on using about six ounces of fish for each diner. Once you master the technique, feel free to add whatever rubs or spices you like. Create bite-sized baked salmon croquettes for a party appetizer or fun dinner presentation without any hot oil using this healthier baked technique. Minced vegetables give the croquettes a pretty color and tasty crunch, and you can use either canned or leftover salmon fillets. Serve with tartar sauce for dipping, but the croquettes are wonderful all by themselves. The sweet-tart sauce that goes with these salmon fillets with cranberry sauce lends both a lovely color contrast and a complementary flavor that will impress your family and dinner guests alike. Cranberries, sugar, currant jelly, orange juice, and onions all simmer down into a sauce that will have you licking your fingers. A green vegetable and a potato or grain rounds it out into a gorgeous meal. Enjoy a taste of New York City with this citrus-balsamic baked salmon recipe from Danny Meyer's "Union Square Cafe Cookbook." 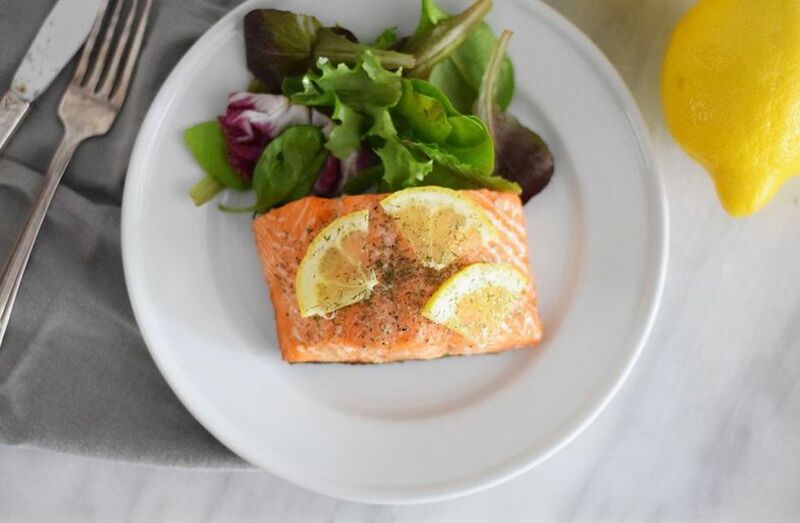 Salmon fillets bake in a vinaigrette made with Dijon mustard, orange juice, balsamic vinegar, and fresh herbs for a slightly sweet, slightly salty, and herbal flavor that's good tasting and good for you. These simple salmon burgers are an excellent alternative to the traditional beef, with a fresh herbal taste that's addicting and easy to prepare. Using canned salmon makes it even more wallet-friendly, but you can use leftover fillets as well. Don't be scared off by the anchovy paste; it lends them a depth and brightness that really makes a flavor difference! The flavors of this easy Asian-inspired skillet salmon will show how simple it can be to prepare a delightful dinner. Salmon fillets cook up quickly in a skillet, so you can have it on the table with fewer than six ingredients and in about 15 minutes. Use fresh ginger for optimal results. In this easy pomegranate grilled salmon, the vinaigrette acts as both a marinade and finishing sauce. You will need to marinade the fillets for at least 20 minutes, so plan accordingly. While it does call for firing up the grill, you can also bake them. Serve them over a salad for a light dinner, so the vinaigrette can double as dressing. For a light lunch or a starter for a dinner party, this salmon bisque is creamy, rich, and warming. It starts with a simple roux, which is a skill you can apply to thicken other soups and stews once you've got it mastered. Garnish it with croutons, roasted red pepper strips, or sour cream for a pretty presentation. Make this entree-sized hearty salmon corn chowder for a chilly evening or whenever you want a warm, comforting bowl of goodness. Kids will love the thick and creamy soup, which you can blend up in the food processor or enjoy as is if you prefer it a little chunkier. Garnish with crumbled bacon for extra crunch. Baking salmon in a foil packet steams the fish with little to no fat, while imparting flavor from the veggies, sliced lemon, and fresh herbs. In addition, this method of foil-baked salmon creates a lovely sauce you can pour over for a perfect, compact meal. It's great on the grill or even over the campfire, and practically foolproof. Start with this tutorial, and get creative as you master the technique. New Yorkers know that the ultimate smoked salmon bagel is the ultimate casual breakfast or lunch and you can make your own at home wherever you live. The addition of pickled red onion, scallions, fresh lemon, and a little dill all complement the slightly sweet smoked salmon and luscious cream cheese. We recommend an Everything bagel, but your favorite variety will also work well. Use high-quality ingredients for the best sandwich experience. Tangy ponzu sauce and nutty sesame oil make a perfect marinade for this sesame ginger baked salmon fillets in this Asian-inspired recipe. If you can't find ginger syrup, just mix 2 tablespoons of honey and 2 teaspoons of minced fresh ginger instead. Serve it over hot white rice for a simple meal that comes together quickly for a busy weeknight. Your whole family will love the sweet and tangy flavors. Whether you're throwing an appetizer party or need a quick and delicious starter for your next dinner get-together, your guests will devour this creamy salmon spread. Serve it on crispy crackers for textural contrast. You can use fresh or leftover salmon fillets or even canned salmon to make it even more budget-friendly. It would also taste great as a sandwich spread on croissants with leafy lettuce. Make this soy glazed salmon jerky in a dehydrator, smoker, or even your oven for a hearty snack you can always keep on hand. It needs to marinade for at least eight hours and it may take at least that long to reach the desired texture, so plan ahead. You can add additional spices or flavorings to mix it up, too. This easy and hearty scrambled eggs with smoked salmon makes a perfect breakfast-for-dinner that you can toss together quickly. Smoked salmon comes in both hot- and cold-smoked varieties. The hot version gets cooked while it's smoking, so it comes out salty and firm. Cold-smoked salmon doesn't, so it stays softer and creamier. You can use whichever you prefer in this recipe, but be aware that the flavor will change. A sweet and savory glaze makes this simple honey citrus glazed baked salmon finger-licking good and it all comes together in under half an hour. Serve them with roasted potatoes or risotto and a seasonal green vegetable like asparagus or Brussels sprouts. You could also grill the fillets for a slightly smokier taste. Any long pasta like linguini, spaghetti, or fettuccine works beautifully in this creamy, hearty salmon spaghetti carbonara. The rich egg and cream sauce complements salty bacon and flaky salmon perfectly and you can also add green peas for a pop of color. Serve it as soon as possible, since the sauce will thicken and could become gluey as it cools. Bourbon, brown sugar, and nutty pecans are the perfect match for salmon fillets in this Southern-accented brown sugar bourbon salmon entree. You can use water instead of bourbon if you prefer, but the spirit gives the fish a lovely, slightly smoky element. Best of all, it all comes together in just about 15 minutes so you can make this elegant meal even on a weeknight. Use tenderstem or broccoli rabe for this pretty and tasty broccoli and salmon tart that works as well for a brunch get-together as it does for a light supper. While this recipe includes instructions for making your own pastry, a prepared shell will cut down on prep time. Arranging the broccoli in a wheel pattern will make a beautiful presentation you'll just have to photograph. Wrap salmon, shrimp, and mushrooms in these light crepes that are much easier to make than you think. Seasoned with dill and sprinkled with cheddar cheese, this seafood crepes with salmon dish is light, fresh-tasting, and decadent at the same time. You can use prepared crepes to cut down on prep time, but mastering the technique is really worth it. Your guests won't believe their taste buds! This green sauce, or "salsa verde," originates in Northern Spain, and gets its bright emerald color from fresh parsley. It's traditionally served with fish and goes perfectly with silky salmon fillets. Squeeze a few lemon wedges over the top for a pop of citrus to round this salmon in salsa verde dish it all out. Roasted potatoes or rice will soak up the sauce. You've probably made ham and scalloped potatoes with your leftover Easter ham, but have you ever thought to do the same with salmon? Flaky fish and creamy scalloped spuds make a delicious salmon scalloped potatoes main dish that's especially easy to toss together when using pre-sliced potatoes and frozen veggies. Use leftover grilled or baked salmon or even canned to expedite the process even further. This light and luscious salmon soufflé isn't as hard as it sounds. Even though it only has two eggs, it sets up high and fluffy. Be warned: It will deflate quickly after leaving the oven, so serve it right away. Feel free to substitute dill or other herbs you like with salmon or use fresh cooked fillets instead of canned. Spice up your lunchtime routine with these easy and pretty sandwich rolls. White bread and smoked salmon rolled with cream cheese makes a great addition to your brown bag. Use flavored cream cheese or toss in some dill, chives, or even capers and pickled red onions for an even more exciting flavor. This crunchy, crispy, and nutty baked salmon mimics fried fish but with a twist. Try it with macadamia nuts or pecans, different herbs, or a spice mixture to suit your personal preferences. Crushed saltines also substitute for panko in this easy and versatile recipe. Toss this salmon casserole in the oven to have dinner ready in half an hour with little active prep time. Either canned or fresh salmon fillets works great and you can adjust the seasonings and types of cheese with your family's favorites. Use cream of celery, potato, or even mushroom soup as the base and either egg or other shaped noodles to hold all of that mouthwatering sauce. Did you know you can make salmon in the slow cooker? This easy main course uses moist heat to make a flaky and flavorful fish, and can sit on low for 6 to 8 hours while you're at work. It also lends itself to experimentation, so add mustard, dill, other herbs, and even different vegetables to tweak the taste. Serve the slow cooker salmon with caramelized onions and carrots and vegetables by themselves or with a side of potatoes for something heartier. This Japanese-style salmon skin salad often appears on sushi restaurant menus and it's simple to replicate at home. Make sure you buy salmon fillets with the skin on or save the skin from another meal. Buying pre-washed spring greens will make it faster, as will a pre-made ponzu sauce or another Asian-style dressing. We usually stuff bell peppers with a beef or sausage mixture, but salmon stuffed bell peppers taste great, too. These peppers get filled with a fish and Parmesan cheese blend that's creamy, flaky, and a lovely contrast to the bright, crunchy peppers. Buy a combination of red, yellow, and green peppers to form a beautiful platter. If you haven't tried salmon with sweet potato, you're in for a treat. These easy fishcakes combine the two in a Thai green curry sauce for a unique, slightly spicy meal. Serve them with a tangy mayonnaise sauce on the side for contrast. Whip up this simple and elegant pesto salmon pasta for an easy and beautiful weeknight meal or for guests visiting on the weekends. Any long pasta works, so go for spaghetti, linguini, or fettuccini. You can DIY a pesto if you want to really go homemade, but bottled or jarred pesto will make a faster meal. Freshly grated Parmesan elevates it even further, so go the extra mile. This Hawaiian raw spicy salmon poke bowl is all the rage and for good reason. Poke, pronounced "poh-kay" is an all-in-one meal that combines sushi-grade fish, rice or salad, and pickled and fresh vegetables. This version blends high-quality raw salmon, pickled cucumbers, and a zesty homemade Sriracha sauce. Build it all over rice or salad for a delicious taste of the island life. Consider your dinner or brunch dilemma solved with a quick and delicious elegant salmon quiche. Go ahead and mix up the flavor by adding asparagus, peas, or other veggies to the egg and salmon mixture. Fresh salmon fillets or canned salmon work equally well. This recipe uses a prepared pie crust, but you can also make your own. Make a restaurant-quality salmon chirashi bowl at home with this surprisingly straightforward recipe. Use high-quality sushi-grade salmon and make steamed rice ahead of time, since you'll want to let it cool slightly before putting this dish together. For a fun, kid-friendly meal, let everyone make their own plates from an array of prepared ingredients. Poaching salmon steaks in white wine or dry vermouth and some classic herbs makes for a classy, deceptively simple dinner that's as appropriate for guests as a weeknight supper. Serve these wine-poached salmon steaks with any of your favorite cream sauces, a starch, and a steamed or roasted vegetable. Don't be intimidated by broiled salmon steaks with herbed butter. You can prepare this thick ruby-red cut in under 15 minutes. Whip up a simple infused butter with fresh herbs like basil, thyme, dill, or tarragon to baste over the fish. Just remember to watch your fish carefully as it cooks; broilers get very hot and can cook much more quickly than you might expect.